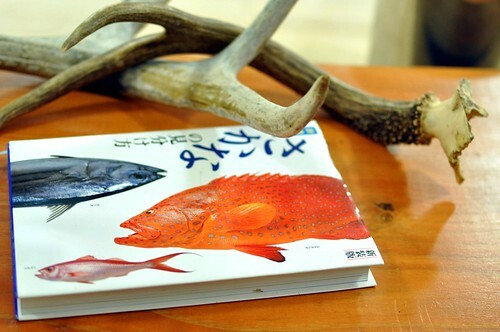 A simple tweet, or was it a taunt, set us down the path – “Aged fish. Concentrated textural magic.“1 Suddenly, there were memories of Sawada in Tokyo pulling out a deep-red slice of tuna, its intense iron taste, and my first (knowing) experience with (purposely) aged fish – a seemingly Bizarro-world that overturned the notion that the best fish is served “fresh.” It does not have to be. Personal preference in these murky waters will probably vary considerably. Dry-aging product intensifies taste by reducing moisture.2 It can also help to tenderize the meat – to a point. After longer periods, the meat tends to get waxier in texture3 as the the tenderizing effects of the enzymes and fungus can not overcome the lack of moisture. Some dry-aging fleshes out the taste, adding complexity, and drawing more flavor from the meat. Different animals require different times – but there are surprisingly few studies on this topic, and most literature is on beef. At what point does the taste shift from terroir to transformative? Is an extended dry-aged (and/or fermented) protein still the protein, metaphysically speaking?4 Again, personal preference will vary considerably in these winds. This was not a normal Saison meal5 – the pictures below come from two different meals at the kitchen counter, the latest last Thursday. There were many dishes not pictured over both meals. 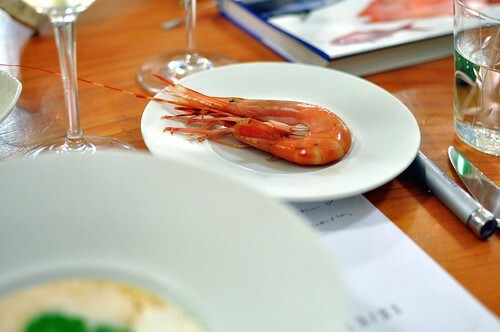 Similar meals can be arranged at the kitchen counter but they must be scheduled and planned in advance – and they quickly approach French Laundry pricing (but are far more enjoyable, in my opinion.) If it is your first time, and lighting isn’t a concern, ask to sit at the hearth bar – an enchanting look at the deliberate work being done on the hearth – the heart and soul of Saison. The sensationalism of the aging fish drew me in but it was the subtle Kindai Bluefin that showed the diligence of Saison best. 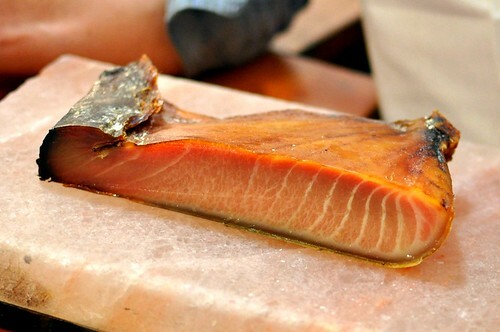 Simple at first sight, various pieces of tuna (very fatty, medium fatty, & loin) are scraped with a scallop shell for the texture, mixed with its roasted sinew from the hearth. 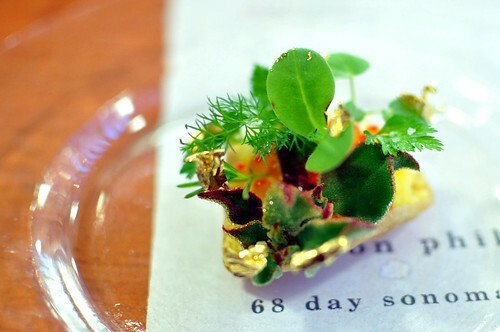 It is topped with white soy and roasted (crushed) tuna bones, from the hearth; and a vinaigrette made from said bones, yuzu, seaweeds, and dried bonito. This was special. 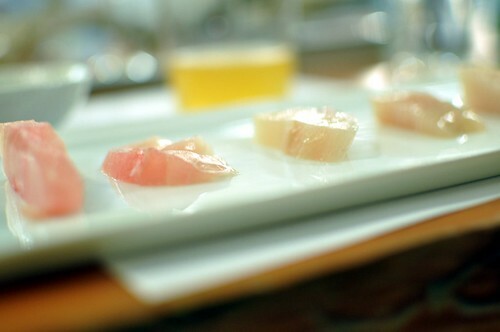 An accompanying glass held the tuna’s spinal fluid. 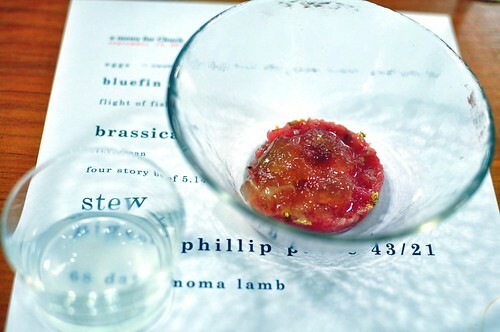 The gelatinous marrow was clean and mellow – with just a hint of salinity and tuna – a very special treat. (See a picture from the bone here.) 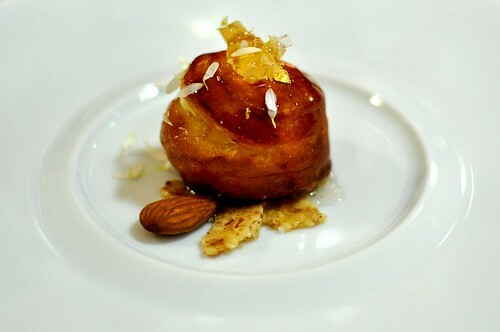 The best of Saison’s style is embodied in this dish – one that could be at home in a three-star Tokyo restaurant. 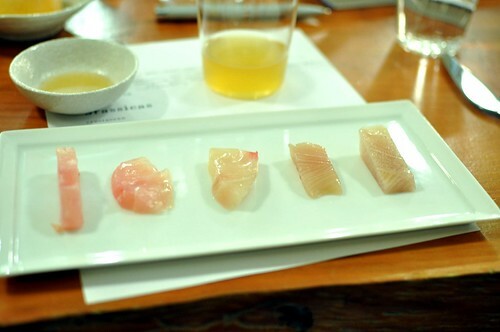 Each of the 7-day aged fish were line-caught from Japan, killed by ike jime, and then dry-aged for seven days. Skenes is serious about his seafood. The texture of each was the obvious give-away – waxy from the moisture loss – followed by a briny burst. Intensity. 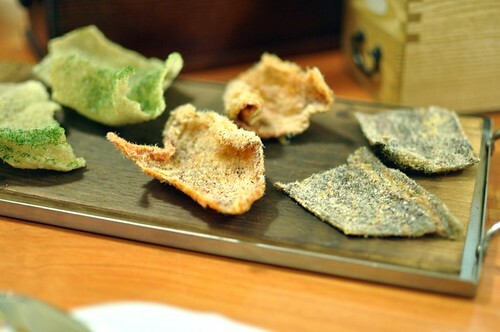 The three skin chips, each a different fish, punctuated the dish with crispy bites of umami. Were they better aged than fresh? Neither better nor worse – but different – they could be used in a menu to very interesting effect. 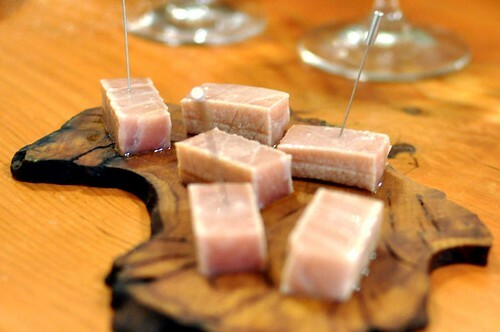 80-day smoked tuna belly was a remarkable two bites. The belly had been aged and smoked periodically, to preserve flavor and texture. The cuboids had a pliable give, still sufficiently moist, despite their age (fat!) – look at the bottoms. Smoky fat instantly coated the mouth and a delicious burst of concentrated tuna belly flavor sprang out. This took the lushness of toro and amped it up several notches – although rich, two bites were not enough! Vegetables are respected and given their proper due throughout the meal. 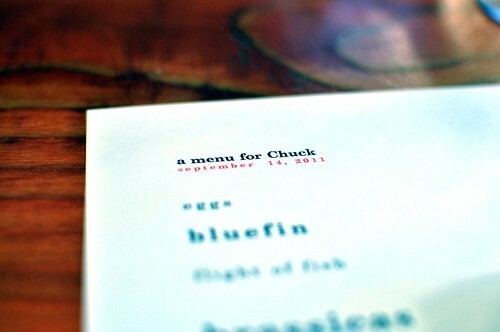 Corn pudding, okra, favas, basil-tomato aspic, zucchini is one or two edits away from being something special itself. At first bite, the corn pudding was a touch too sweet. And suddenly, a surprising sweet and sour effect kicked in, changing from one to the other with each bite. A largish piece of avocado seemed misplaced. 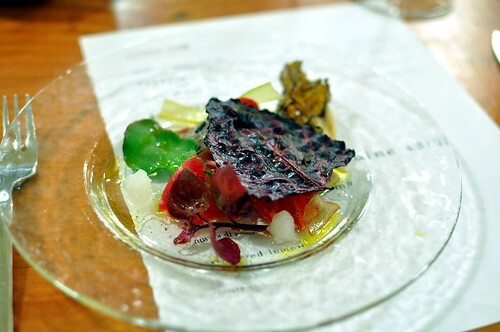 And then there were the textures – this is why inventive vegetable dishes have so much to offer. Raw or seared, minimalist or composed, it can be so difficult to judge someone’s preferences. 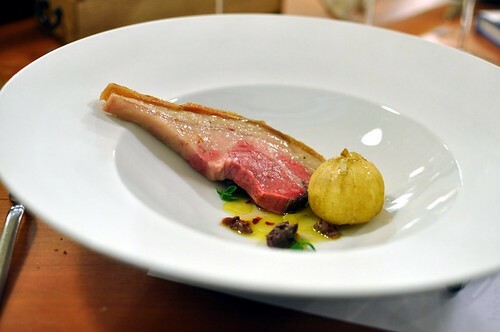 The beef was sliced very thin, heated by hearth coals for an instant, and hidden beneath a bitter crisped leaf, herbs, and a vinaigrette made from roasted bones. It was the best ingredient of the first night but the dish was too busy – Skenes agreed, admitting he over-thought it at the last minute. Fruity, nutty, and complex, brightened by the vinaigrette, its fat carried a nice mouthfeel and remarkable sweetness. It was similar in sweetness to Manglitsa pig7, presumably a function of the age. Two bites of magic. 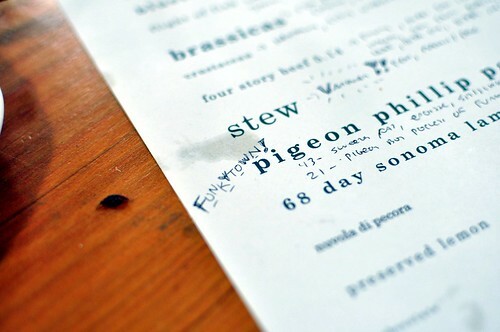 And then were was a parade of pigeons – 21-day, 43-day, 50-day, and 73-day – across both meals. All were Paine Farm, smothered (to keep the blood inside for more taste), and hung with their viscera intact just short of a week. After that, the insides are removed to prevent them from spoiling the bird. At that point, the bird can be dry-aged or its cavity can be salted for a fermentation/curing effect. The results over three birds were dramatically different. The 21-day Paine pigeon had chocolate undertones throughout, with nice crispy skin from the hearth and some delicious melting fat. There were some small pockets of funk near the edges – traces of what was to come. Still tender and juicy, it should appeal to most fans of pigeon. Its cavity was not salted before aging. 50-day Paine pigeon was the consolation prize after the 43-day did not pass Skenes’s quality control. Tasting of Epoisses, it has a tremendous umami qualities where you just kept licking the inside of your mouth after each bite. There were also some nice cherry fruit notes. Waxy, without much moisture, the texture and tastes will certainly not please everyone. The fat was still sweet but it was teetering. It was a highlight for me, unlike anything I have tasted. The cavity had not been salted; the enzymatic activity responsible for the funkiness. A few weeks later, The Ulterior Epicure and TomoStyle went to Saison and had an older pigeon – I missed out that week for I knew I would be back shortly. (Hopefully they publish reviews sometime soon!) 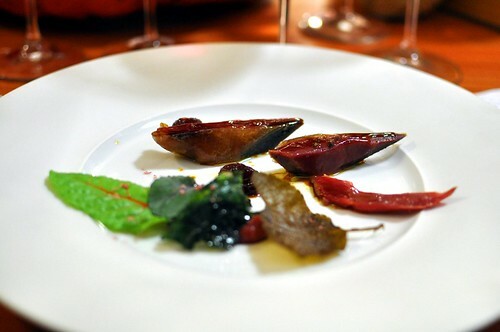 A 78-day Paine pigeon tasted intensely of pigeon, with much less funk than the 50-day. There was a complexity not found in the 21-day, with plenty of chocolate, some fruit, and minerality; and this might appeal to a larger audience than the 50-day. 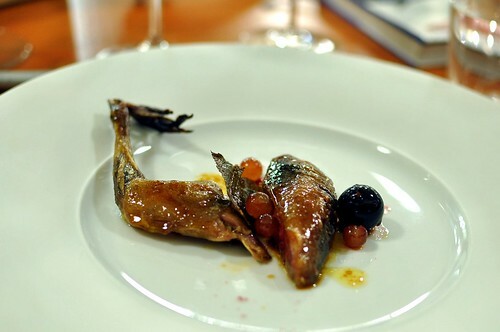 This bird was fermented (cured) instead of pure dry-age, as its cavity had been salted once the internals were removed. Closing the first meal, a 68 day Sonoma lamb was overkill at this point in the meal – lamb amplified. After a night of strong meats, the story of this dish might have been the tomatillo. Roasted simply on the hearth, its slight lemony tang provided respite from the intense fat. Every (savory) dish at Saison touches the hearth and, sometimes, the enjoyment of a dish can be stripped down to just one impeccably sourced ingredient. 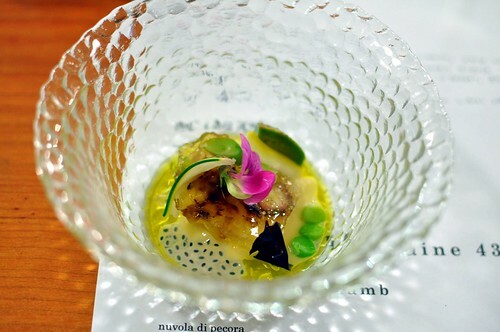 Nuvola di percora is one of those rare finds on tasting menus – a composed cheese course that not only works, but succeeds with decadent pleasure. Sweet and salty, light brioche and gooey cheese, it is well-balanced, interesting, and very delicious. 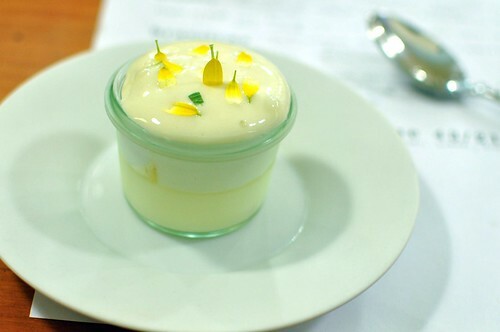 Preserved lemon too has a mastery of temperature, texture, and flavors – four different levels of sweet and sour bites. It has been served with most of my seven meals and there is no reason to stop – great stuff. Skenes has a vision – of fire and nature. It flirts and borrows from the Nordic and Flanders with its foraged and primitive elements but he coalesces the food around the hearth and its infinite variation. It does not champion the rustic, or romantic, as much as it does purity and minimalism. For this, it is more Japanese in its outlook and offers something unique. The big taste of aged meat will be an interesting direction for Skenes’ subtle work. The meats fit into the framework of what he is trying to achieve – nature’s deepest flavors – and it will be interesting to see how they continue to find their way into the menu. Few restaurants Stateside are exploring this territory.8 With the fire, letting age act as another element in the cuisine seems like a natural complement to the Saison menu. 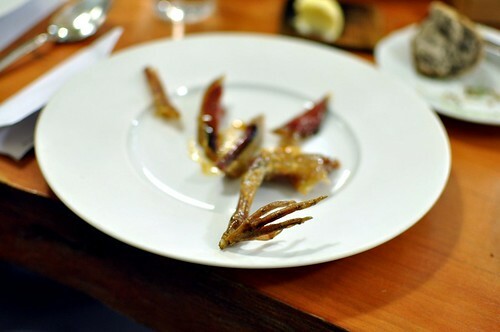 1 – Funnily enough, I mentioned dry-aged fish in my last review of Saison. Unknown to me, Skenes was already under-way with experiments. Hunter Angler Gardener Cook has a great blog post on hanging pheasants. David Chang from Symposium on Vimeo. 3 – Every individual animal is different with seasons and feed almost certainly playing large roles. The diet is probably very important, as some farmers can control the make-up of their animals through daily changes of diet. I have had grass-fed, grain-finished Angus cows from a local butcher where an 8-week aged ribeye had a minerality that was very intense. With the next batch, 10-weeks, the texture of the meat was on its way to resembling a ham, but without the intensity of the 8-week. Variations in initial product quality probably contributed to the vastly different outcomes. 4 – Modern day meat preferences are pretty limited. When someone tastes a heritage breed chicken, a common complaint is that it’s “too strong”; similar to people who try grass-fed beef and complain of its wonderful “gaminess.” So there could be cultural resistance to aged proteins beyond the norm. Antoine Carême advised holding beef joints at room temperature “be taken as far as possible.” Those French called it mortification. Different times, different preferences – I obviously love the exploration into what could be. And is it really different than the many forms of longer fermentation found in other cultures? There, in many cases, the base product is transformed radically into something pungent and, sometimes, delicious. 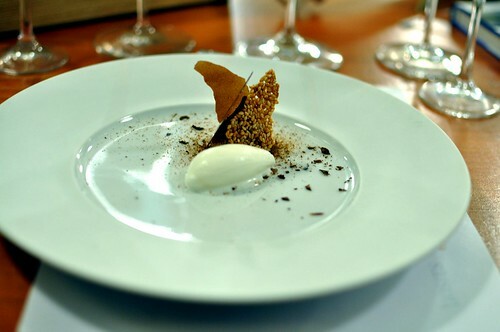 6 – Dan Hunter served a grain-based dish at the (relatively) recent Royal Mail / Manresa dinner – puffed rice, egg, legumes, rye, & yeast. It was the table’s favorite with everyone complimenting “the textures.” If vegetables can now be centerpieces, why can’t grains? 7 – Manglitsa fat will get much sweeter when frozen – has anyone noticed this? Do the ice crystals break the fat molecules and cause more sweetness? Any scientists reading this? I’ve also noticed a similar effect when I freeze a 9-week dry-aged steak – after de-thawing, its fat is much much sweeter. Is it possibly enzymatic despite being frozen? 8 – Outside of Roberta’s in Brooklyn, during the special nightly menu, there are few restaurants tackling this dimension of meat. If you know of other places in the US, please leave a comment, I would be very interested to hear about them. Do you know what his method for aged fish was? Temp or technique? We are aging our Local Grass Fed Grain Finished beef and Local Grass Fed Ducks at the Clifton Inn In charlottesville Va. Also Sean and Jerimah at McCradys in Charleston are aging ducks and probably other things knowing those guys. thanks Tucker – you’re probably right about Sean too – what doesn’t he do? he’s awake 30 hours/day! What great timing on your post. Did you know that Saison was going to receive two Michelin Stars today? 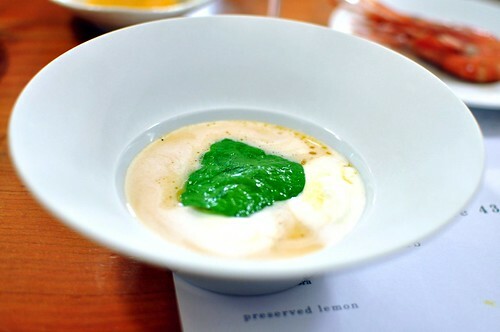 I ate at Saison recently and it is a work in progress (basically a confusion of flavors and textures). This is what happens when think you are too hot. 1. I found the vegetable aspic to be very good. My piece of avocado was not “largish” at all and provided a nice buttery note. 2. The chocolate dessert was, for me, the weakest dish of the night. 3. 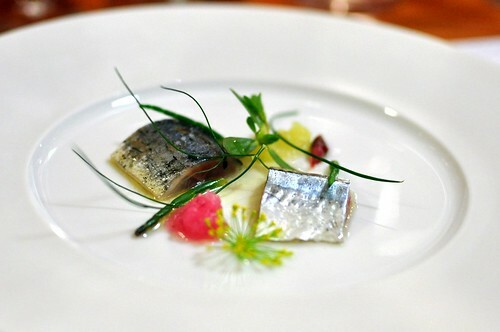 I didn’t find the shot of cerebral tuna shot great either (though was very much looking forward to it!). 4. 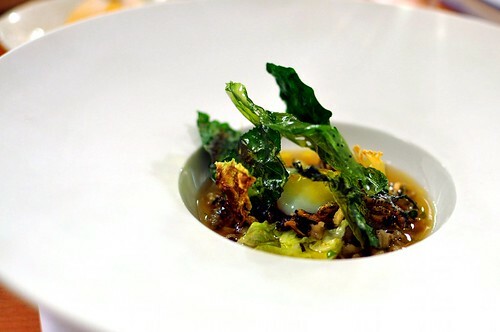 Strongest dishes were certainly the shrimp/soup, brassicas, aged pigeon & lemon. It will be fascinating to watch Skenes grow Saison into what I’m sure will be a 3-star joint. I hope to return to the bay area in the next few months and will contact him to organize an extended tasting of aged meats. Would be great to grab a meal w you. “smothered (to keep the blood inside for more taste”…Wonder if the hell one must feel when being smothered adds yet another dimension of taste. Next trend in ‘high-level’ eating: the 6th taste: fear. you already buy that at the supermarket – in an industrial lot, the animals know what’s going on – stress does affect taste. there’s already quite a bit of study on this topic. What book is that? I’m tryin to locate it but can not find it. Please help. Wondering if you have any reaction to the recent changes at Saison? Not so much the price for the chef’s table experience, more the reduction of seats. I’m planning on visiting next week, before the changes and for the regular dining room. i’m always a fan of less seats – but i didn’t think the regular dining room was particularly crowded to begin with. i also love the idea that you own the table for the night – every serious restaurant should be this way imo. Hey Chuck, IIRC, Yasuda also ages their fish for a few days. I remember asking about that.